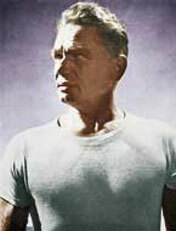 Joseph Pilates was born in Germany in 1880 and died in New York in 1967. He developed a fitness regime from self study and apprenticeship in Greek and Roman forms of exercise, yoga, and Zen. As a young boy, Joseph hid in the woods for hours studying animal movements which sparked the idea for the names of exercises, i.e.… the swan, elephant, monkey, hawk etc….He successfully used his regimen of exercise to overcome his own disabilities as a frail and sickly child. The exercise system includes elements of boxing, gymnastics, strength training and yoga. He went to England and worked as a self defense instructor for the detectives at Scotland Yard. While in England during WWI he was interned with other Germans as an “enemy alien” and refined his exercise system. He then became a nurse and governed the exercise programs for the soldiers and rehabilitated the injured ones. Joseph designed exercise apparatus for immobilized patients by attaching springs to hospital beds, enabling bedridden patients to exercise against resistance. This system formed the foundation for his style of body conditioning, and the specialized exercise apparatus that we still use today. His goal was to create and maintain a structurally fit body without building bulk. The basic principles of Pilates conditioning are to make people more aware of their bodies as a single integrated unit, to improve alignment, balance, breathing and to increase efficiency of movement. Milner Pilates incorporates the ideologies and movement concepts of Joseph Pilates on both mat and equipment but approaches it uniquely by focusing deeper on the proper body mechanics ensuring correct firing patterns of the muscles so that the most efficient movement to the highest level of performance is achieved. Special attention is given to teaching the fundamentals of mat first so that the Pilates exercises are accurately executed. Once the basic beginning exercises are achieved and performed correctly, a layering of the more intermediate and then advanced exercises are introduced. Mat work uses the body’s own resistance to build strength and flexibility. Equipment work is strongly encouraged to accompany the mat. It works the entire body by using a spring based system which provides more resistance furthering the enhancement of muscular control, tone, balance, coordination and strength. But most importantly it allows for the proper assessment of muscular imbalances so corrective alternatives can then be enforced through a specifically designed program that addresses each need. Over time, Milner Pilates will realign the body’s structure, strengthen the deep skeletal muscles which support the larger muscles and train the muscles to fire in correct order for proper body movement resulting in less injury. In other words participants especially athletes will be able to jump and kick higher, run faster, spin tighter and generally perform better because they will have a greater awareness of their body, a more efficient body and a sense of balance and harmony within the muscular-skeletal system.